As electric guitars became widespread in popular music, backyard workshops and production line factories emerged to supply the requisite amplifiers and speaker boxes. In the United States, Fender and Gibson were among the early brands. In Britain there were Vox and Marshall. In New Zealand, Concord, Jansen, Holden and Fountain built the first combos and amplifier heads. Early models from Concord and Jansen ranged from four to 15 watts – tiny alongside a modern domestic stereo – with options of tremolo or reverb effects. Within a decade guitar amplifiers expanded to 400 watt stacks, more than three times bigger than anything used by The Beatles. Amplifier designs progressed from three valves to more than a dozen. By the late 1960s both Jansen and Fountain were building combos between 15 and 100 watts. Jansen also manufactured a popular series of small amplifier tops delivering up to 150 watts, styled after the Fender Bandmaster. 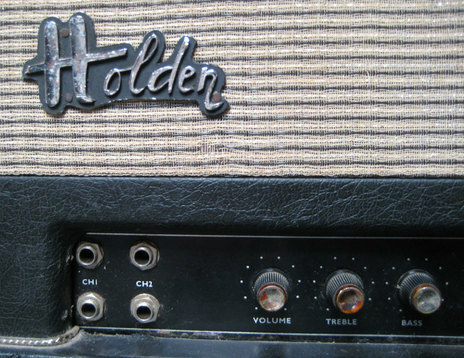 Christchurch-based Holden adopted the Fender style for its first Wasp 100 watt model before switching to a Marshall look for the Australian market with its 100 watt VBL and 200 watt XL. 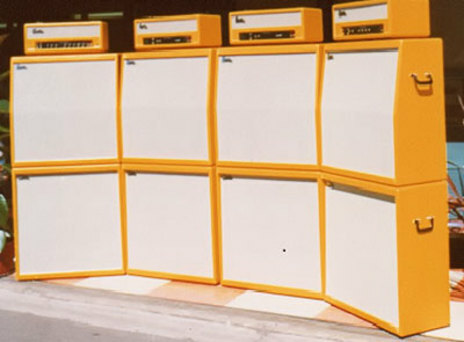 Holden Wasp – as the brand was known in Australia – soon gained a reputation for huge power with two 400 watt bright orange-coloured stacks, built for heavy rockers Ticket; and for use of the VBL by AC/DC. The late 1960s marked a transition away from valves to cheaper and lighter transistors, with both Jansen and Holden moving to solid-state during the next decade. Valves retained favour with short-lived boutique labels Gunn and Abbey. Rockit also produced valve combos and heads before switching to solid-state. Marked after 1961 as providing independent channels for two instruments with full tremolo, the Contina produced five watts into an eight-inch speaker with tweeter, a big sound "designed for clubs, parties and small halls". Available with beige or oyster heavy vinyl cover. Saron grille and gold trim. Concord was the brainchild of jazz pianist Bennie Gunn. Aged 21, he arrived in Auckland from Wellington in 1957 driving his homemade plywood sports car and intent on becoming a professional jazz musician. Between gigs the former Broadcasting Service technician and radio engineer designed and built public address systems and office intercoms. With the arrival of rock and roll he branched into guitar amplifiers and assembled his first Concord combos in the basement of a Symonds Street rooming house popular with jazz musicians. The 10 watt Conquest model with one 12-inch speaker was described as "plenty of power in small to medium-sized halls and clubs." The 10 watt Conquest model with one 12-inch speaker was described as "plenty of power in small to medium-sized halls and clubs" in an era when two watts was regarded sufficient to amplify the larger acoustically-designed town halls. The Constellation 9350 combo, rated 35 watts, was described as "a professional amplifier which takes recording sessions, outdoor concerts and the biggest dances all in its stride." Production moved to a backyard factory in Ellerslie after 1960 when Concord was building about 1000 amplifiers a year with high profile users including Tommy Sands and the Sharks, the Quin Tikis and Maori Hi-Five showbands, Johnny Devlin, guitarist Peter Posa and Ray Columbus and The Invaders. Eko guitars from Italy were advertised alongside a Concord Super Chief. One early version of Ray Columbus and his band featured two guitars and vocals all plugged into a Super Chief. Gunn constantly tested his designs on local and touring international musicians for improvements. Gunn toured New Zealand with backing bands for acts including Gene McDaniels and B.B. King, and established a national network of 50 Concord dealers with exports to Australia and Fiji. Concord later branched into guitar manufacture with a purpose-built factory in Northcote but then stepped away from rock and roll after 1965 as the company diversified into industrial electronics, domestic hi-fi and marine electronics, depth gauges and "electronic counting and computing units." Released 1960. 4.5 watts. 9 x 6-inch elliptical speaker. Designed for home use. One input with volume control. Released 1960 to 1964. 5.5 watts. Three tubes. Two inputs. Volume and tone control. 9 x 6-inch elliptical speaker. Described as ideal for students with inputs to plug in record player and guitar and play along. Released 1960. 6 watts. 9 x 6-inch dual cone elliptical speaker. Four tubes. Two inputs with volume and one tone control. Released 1961 to 1964. 5 watts. Four tubes. Two channels with volume control. Tremolo. Eight-inch duo-cone speaker. Released 1961 to 1964. 10 watts. Six tubes. Three inputs with two volume controls. Tremolo with foot switch. 12-inch medium speaker. Released 1961. 12 watts. Three inputs with one treble and two normal or tremolo. Two volume controls. Six tubes. Two 9 x 6-inch dual cone speakers. Released 1961 to 1964. 15 watts. Seven tubes. Two channels with two inputs each. Bass and treble tone controls. Tremolo. Single 12-inch heavy duty speaker. Released 1961. 35 watts. Eight tubes. Three channels. Treble and bass tone controls. Tremolo depth and speed controls. Two 12-inch heavy-duty hi-fi speakers. Foldout control panel. Released 1964. 15, 25 or 35 watts. Eight tubes. Two channels with two inputs each. Bass and treble controls. Tremolo. Released 1964. 15, 25 or 35 watts. Eight tubes. Four channels. Bass and treble tone controls. Released 1964. 15, 25 or 35 watts. 10 tubes. Two channels with four inputs. Bass and treble controls. Reverb. Released 1964. 25 or 35 watts. 13 tubes. Two channels with four inputs. Bass and treble controls. Vibrato and reverb. Released 1964. 35 watts. Nine valves. Two channels with two inputs each. Separate bass and treble controls. Twin depth and two-speed tremolo controls. Reverb. Two 12-inch heavy duty speakers. Also customised Constellation 9351. Released around 1965. 25 watts. Four inputs with preset tones and two channels. Six tubes. 12-inch speaker in sealed cabinet. Released around 1965. 50 watts. Six inputs with preset tones, three each for lead and rhythm. Two channels with volume, bass and treble. Reverb and echo. Tremolo with remote foot control. Eight tubes and two transistors. Pressure-loaded cabinet with two 12-inch duo-cone heavy duty speakers. Released around 1965. 15 watts. Six tubes. Two channels with four inputs. Also Bass amp head 5304. 35 watts. Five tubes. Two channels with four inputs. Released around 1965. Reverb channel with own amplifier and speaker that can be placed away from main amplifier to provide stereo. Seven watt amp with six tubes, eight-inch speaker and two inputs. 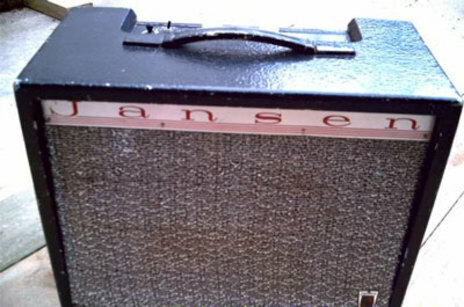 The first Jansen amplifiers were named after technical details such as number of valves and wattage. The I-A series started with the five-watt I-A33 and reached 25 watts with the silver-panel I-A715. Bruce Eady and Jack Collins repaired pianos and assembled imported amplifiers in upper Queen Street, Auckland, as the rock and roll craze took off in 1959. Amid a shortage of Concord amps they started a small production line to make five to 15 watt combos in the Methodist Central Mission building opposite the Town Hall. With a shift to a purpose-built factory in Pollen Street, Grey Lynn, and later Ruskin Street in Parnell, Jansen expanded into manufacture of guitars and electric organs. 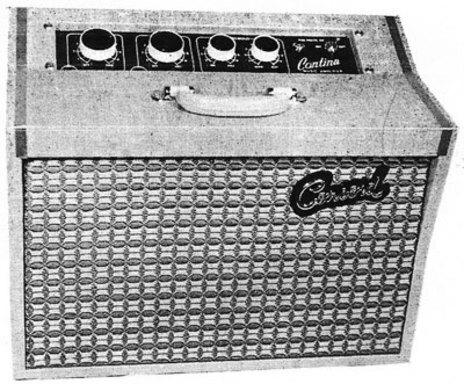 Early amplifier designs included the I-A series with controls recessed on the top of the cabinet, and the 5/10 and 6/12 models that introduced the Fender-styled sloping control panel. Numbering usually indicated the number of valves and wattage output. The highly successful Bassman 6/35 and Bassman 50 – modelled on the Fender Bandmaster released in 1953 – housed the amplifier in a small cabinet, with a separate cabinet for speakers such as one 15-inch or four 10-inch. The Bassman gained a reputation as an amplifier for an entire band with one channel for vocals and a second channel for two instruments. The Bassman 50 was followed by increasingly-powerful Bassman heads and the Six-series guitar combos. In 1965 a Bassman 50 top cost £108 (with another £120 for a speaker cabinet with four 12-inch speakers). An 8/40 twin combo cost £186. Jansen amplifiers and guitars were associated with high-profile performers including Peter Posa and Ray Columbus & The Invaders. In the mid-1960s its 100 and 150 watt heads were popularised by the Dave Miller Set, the loudest of the power trios in Sydney. According to Miller, "the powerful Jansen gear gave an edge over most other Sydney groups." By 1972 Jansen had stopped guitar manufacturing and focused on solid-state PA systems with the highly popular PA-80 and PA-150. By late 1974 Jansen was shipping 30 guitar amplifiers and 30 speaker cabinets each month. The PA 5-100 introduced in 1979 remained in production for more than a decade. Valve models continued with the Pacer bass amplifier (a hybrid solid-state and 7027A output valve design) followed by the Liberator and Dominator. In the late 1970s the first MOSFET (metal oxide silicon field effect Transistor) designs appeared. Manufacture of Jansen-branded amplifiers ended in 1999 as cheaper Asian imports increased after the removal of trade tariffs. In 2001 The D4 named their debut album 6Twenty – named after the Jansen amp of the same name. Released early 1960s. About five watts. Three tubes. Two inputs. Volume and tone controls. Released early 1960s. 10 watts. Two inputs. Tremolo. Twin 10-inch speakers or single 12-inch. Released early 1960s. 15 watts. Six tubes. Two channels with separate controls. Six tubes. Tremolo. Heavy duty 12-inch speaker. Silver-panel combo available in 10, 20 and 25 watts using EL84 or 6L6 output tubes. Released early 1960s. 10 to 12 watts. Heavy-duty 12-inch hi-fi speaker. Also 6/15. Also 3/4 combo. 5 watts. Two inputs with volume, bass and treble controls. 10-inch speaker. Released around 1962. 25 watts. Fender piggyback style. Released around 1962. 35 watts. Normal and bass channels with two inputs each. Separate bass and treble controls. Released around 1965. 50 to 60 watts. Two channels with two inputs each. Separate bass and treble controls. Also Bassman 75, 100 and 150 watts. The Bassman design used a single ECC83 [12AX7] valve for each input channel as used by Fender. Output tubes were mostly 6L6 [also used by Fender], or 7027A in bigger models. Released around 1964. 20 watts. Two channels with two inputs each. Separate bass and treble controls. Single heavy-duty 12-inch speaker, or two in twin model. Smallest of Six-series combos. Also 6/30, 6/35, 6/40 twin with tremolo, 8/40 with reverb, 8/ 50 twin, 12/ 60 with tremolo and reverb, and 12/ 100. Top of the range was the 14/ 60. Custom professional model with two 8/40 circuits on one chassis. Useable as two standalone amps or coupled to provide 85 watts. Separate reverb and tremolo on each amplifier. Exclusive "rolling vibrato" which rotates sound between two speaker cabinets containing four heavy duty 12-inch speakers each. Includes tuning tone of 440hz. Released around 1974. A hybrid of solid-state preamp and 7027A valve output. Released around 1974. 200 watts. Released around 1974. 100 watts. Intended as an all-purpose amplifier for an entire band, the VBL provided channels for vocals, bass and lead. Its Marshall-style recessed front panel for control knobs reinforced its reputation as a power amplifier. Australian rockers AC/DC used a VBL before switching to Marshall. In the mid-1960s Ron Holden in Christchurch built some custom amplifiers for guitar and bass in a spare room above his father's photographic shop. His first production run in 1967 introduced the 100 watt Holden Wasp with a matching 4 x 12-inch quad box of Philips 25 watt speakers. The amplifiers gained prominence in New Zealand after they were stocked by national music chain Beggs. Chassis assembled in Christchurch were also shipped to Sydney, Australia, for fitting into cabinets, where the Holden Wasp name was adopted to avoid confusion with Holden cars. The brand gained international endorsement with use of the VBL by guitarists Angus and Malcolm Young in AC/DC. Holden next redesigned the chassis and control panel to a recessed Marshall style and introduced VBL and XL models. The Holden Wasp received early reviews for outstanding power and the brand gained international endorsement with use of the VBL by guitarists Angus and Malcolm Young in AC/DC. A rig of two 200 watt heads [XL and VBL], two 200-watt slaves and eight quad boxes in orange vinyl was shipped to Eddie Hansen and Paul Woolright in Ticket in Australia during 1972 and "caused a sensation" according to Mike Lewis, who took over Holden in NZ the next year. Lewis continued production of valve amplifiers with the V80 and Musician 100 combos, and also expanded into solid-state, stomp boxes, mixers, crossovers and equalisers. Speakers changed from Philips to Plessey 12U50, with later combos fitted with Celestion, ETONE, Nessel and occasionally a JBL K-120. Holden attracted the attention of Roland founder Ikutaro Kakehachi, who considered opening a factory in Christchurch. According to Mike Lewis at Holden he "loved the styling" of the solid-state DC208 bass head. "He wanted us to manufacture Roland products in New Zealand because we could not import them and I said 'I'm sorry we work more or less from a shed'. Kakehachi could not believe we were such a small-time operation producing amps like we did." By the late 1980s with the end of trade tariffs Holden shifted away from valves into production runs of solid-state power amplifiers and mixing consoles, but stopped all production in 1995. Released around 1967. 100 watts. Two KT88 output tubes. Fender-style sloping control panel and grill cloth. Normal and brilliant channels with two inputs each. Volume, bass and treble controls. Second channel also presence, and tremolo depth and speed. Released around 1969. VBL stands for vocals, bass, lead. 100 and 200 watts. Two channels with two inputs each. Volume, treble and bass controls. Also mid and presence on second channel. Two gain stages with four 12AX7 tubes. Released around 1969. 100 and 200 watts. XL designed for lead guitar. Two channels with treble, bass, mid and presence. PA mixer amp. Four input channels with bass, treble, mid and presence. Released around 1969. Slave 100 used two KT88 output tubes. Four KT88 in Slave 200. Released 1973 or 1974. Two EL34 tubes in V50. Two 6550 valves in V80. Design based on the original Holden Wasp. Released 1973. Lead and clean channels. Released 1974. A variation on first Holden Wasp plus solid-state reverb. Released 1974 or 1975. 100/50 watts switchable. Four EL34 tubes. Master volume/overdrive. Effects send and return. First design retaining Fender-style preamp but redesign of output stage with four EL34 tubes and new power transformer. Released 1976. 100 and 200-watt amp head. All-linear fader controls plus rocker selector switches. Only about 25 manufactured because of very high costs. Released 1976. GBL stands for graphic bass lead. Hybrid design combines solid-state graphic seven-band equaliser preamp with classic valve output stage. Same preamp used in big selling solid-state Graphic DC208 bass head. 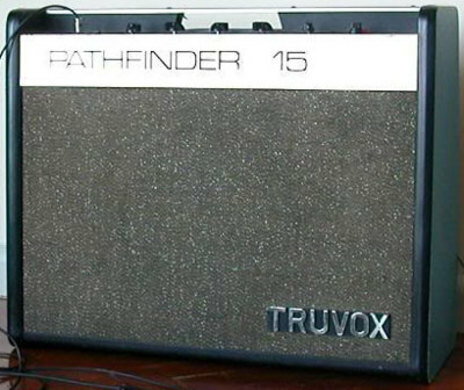 Marketed as either Fountain or sometime Truvox, Fountain extended its home hi-fi products into full-frequency guitar amplifiers with the 15 watt Pathfinder. and larger Mustang and Thunderbird. The 125 watt Fireball never reached production. Fountain was started in the mid-1960s in New Lynn, Auckland, by Jim and Doug Eckford with Alf Veart as design manager. Early amplifiers were built for domestic hi-fi before Fountain added manufacture of guitar combos variously marketed under the Fountain or Truvox brands. Designs included EF86 tubes of near hi-fi quality, suspended on rubber straps for the preamp and tremolo. The Pathfinder and Mustang models were regarded as versions of the Vox AC15 and Vox AC30 with their use of EF86 input tubes, and EL84 outputs. During the early 1970s manufacture of guitar amplifiers was phased out as Fountain concentrated on solid-state domestic audio, and transistor and clock radios. By the mid-1980s the company produced only car audio before closing down with the end of local car assembly. Released 1968, 55 watts, two channels, tremolo. In 1972 guitarist Gray Bartlett and his brother Barry set up Gunn in a factory in Papatoetoe. With Gray testing designs from ex-Jansen amplifier builder Ken Wilson, Gunn manufactured amplifier heads for guitar and bass, and the 100-watt Classic combo. Bartlett: "We were finicky about parts and how it looked and how rugged it was. We used to knock them around to see if they would handle what happens in the back of a van." Bartlett was on a career high with his B-side composition ‘La Playa’ selling 410,000 units in Japan. He used the Classic on all major tours. "It was reckoned by most of the Americans to be the equal of the Fender if not better than some of them," he says. Gunn started exports to Australia with Gray Bartlett acting as salesman and clocking up orders worth $50,000 on one trip. But after about a decade Gunn stopped production, with Bartlett deciding to concentrate on his guitar playing. Released 1972. 50 watts. Two channels with volume control and two inputs each. Channel one normal and channel two bright. Treble, mid, bass and presence controls. Released 1976. 100 watts. Two channels with simple tone controls on channel one, and Marshall-type tone controls with foot-switchable gain boost on channel two. Tremolo and reverb. Two 12-inch speakers. Uses ECC83 inputs, ECC82 drivers and EL34 output valves. Power amp circuit similar to some 200 watt Marshalls. Started in late 1973 by ex-Concord assembler Paul Johansen, Auckland-based Sonic was among the early manufacturers of the new transistor-based solid-state amps. 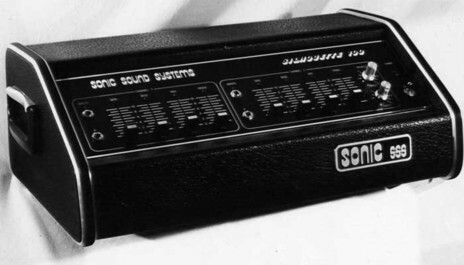 The 100-watt Sonic SA100 and Sonic Silhouette MA100 appeared during 1974, with the SA100 described as “the smallest pro audio multipurpose amplifier in the world” and the MA100 with a variable-filter tone control circuit and tremolo “probably the first fully solid-state amp top made in Australasia”. Auckland jazz guitarist Martin Winch and bassist Andy Brown featured among MA100 users. Production of both amps continued for several years as Sonic expanded into powered speaker boxes, mixers and PA amps. Production from 1974 until about 1980. 100 watts solid state. About 800 produced. Single channel with two inputs. Controls for gain, gain with treble boost, treble and bass. Production from 1974 until 1978. 100 watts solid state. Two channels with two inputs each. Channel sliders for volume, bass, mid and treble. Tremolo. Professional musician, electronics engineer and onetime Holden employee Ross Nichol built his first Abbey amplifier in a spare bedroom of his house in Christchurch in 1975. Two models were produced based on Vox and Mesa Boogie styles. In 1980 Abbey shifted to Melbourne and expanded into renting rehearsal studios. Released late 1970s. 100 watts. Normal and brilliant channels with two inputs each. Based on Vox AC-30 but output boosted using four EL34 tubes, and three preamp tubes similar to Vox AC-50. Released around 1982. 100/50 watts. Four 646GC tubes. Presence control. Manufactured as combo 112 with JBL E120 12-inch speaker, or amplifier top. Fijian Indian guitarist Anil Naidu immigrated to Auckland in the early 1970s sponsored by Jansen to work as an electrical engineer. He built his first custom guitar amplifier in his garage at Onehunga in 1977 ­– a 100 watt tube combo with 12-inch speaker for Living Force guitarist Harvey Mann who helped design the tone distortion. The day after the amp was completed Living Force second guitarist Eddie Hansen ordered one for himself. With a reputation for matching the power of 100 watt Marshall stacks, Rockit combos became the amplifier of choice for bands including Hello Sailor, Bamboo, Th’ Dudes and Herbs. Three models were produced using tubes before Rockit switched to solid-state 120 and 300 watt bass tops, PA amplifiers, and the Prochamp 60, Prochamp 100 and Prochamp 120 guitar tops. Some Naidu-designed Rockit amps such as the Prochamp 60 incorporated a modified version of the Hotcake distortion pedal in the front end of the overdrive. Rockit continues production of MOSFET music amps, and has expanded into hi-end hi-fi amps mostly for export to Australia. Released late 1977, 75 watts. Released late 1970s. 130 or 75 watts switchable. JBL E130 speaker. Single channel switchable between clean and sustain, brite, boost, sustain and fat selections. Spring reverb. 12AX7 tubes in preamp and 6L6 valves in power stage. Released late 1970s. 130 watts. Christchurch-based rock trio Ticket received early designs from Holden including a stack of amplifiers and speaker boxes providing 400 watts for guitarist Eddie Hansen and another 400 for bass player Paul Woolright. The orange-covered stack for Ticket quickly proved popular but also impractical as the burnt orange turned black from daily use. Special thanks to Clarry Schollum.